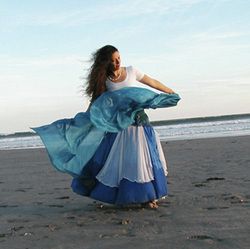 Spiritual Belly Dance is a path of mystical openings of the heart and transformations of the spirit. Fluid yoga stretching and somatic release work frees your pelvis and strengthen your back in preparation for exploring the Belly Dance movement vocabulary of powerful hips, sensuous spinal undulations, evocative hand gestures and expressive eyes. The full, rich curves, circles and spirals of Belly Dance are perfectly suited for moving our bodies in ways that celebrate our beauty as women. We will deepen our explorations with expressive movement exercises designed to unblock stored tensions, heighten awareness of inner discovery, increase sensual energy and support spiritual unfoldment.